In 2017, dog bites and dog-related injuries accounted for more than one-third of homeowners liability claims according to the Insurance Information Institute. There are approximately 89.7 million dogs in the United States and 36.5% of U.S. households own at least one dog. The average cost per dog bite claim was $37,051, totaling over $700 million paid out in 2017. Most dog bites involve dogs that are not spayed or neutered and children and the most frequent victims followed by senior citizens. Other dog-related injuries include dogs knocking down children, cyclists and the elderly which can result in injuries. In 2017, California continued to have the largest number of claims at 2,228 which was an increase of 294 from the previous year. 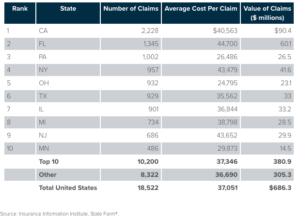 The state with the second largest number of claims was Florida with 1,345. The number of dog bites nationwide totaled 18,522, an increase of 400 claims from the previous year (2.2%). The dog breads that bite the most include Chihuahua, Bulldog, Pit Bull, German Shepherd, Jack Russell Terrier, Cocker Spaniel, Bull Terrier, Pekingese, Australian Shepherd, Lhasa Apso and Papillion. So what should you do if your dog bites someone? First, address any medical needs immediately. Apply pressure with a bandage or a clean, dry towel to stop any bleeding. Gently clean the bite with soap and water. Then seek medical attention to prevent infection or other complications. You should also take photographs to document the bite and is possible, exchange information with the dog’s owner. If there are witnesses, obtain their contact information in case a claim is filed. Finally, file a report with local animal control or other authorities to document history for the dog.